← Libraries. We lend books. Don’t ask us to do anything else or we might just do it. 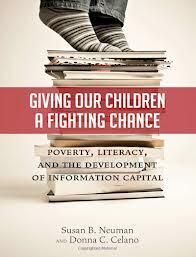 A book that has really hit me in the gut is Susan B. Neuman and Donna C. Celano’s Giving our Children a Fighting Chance: Poverty, Literacy and the Development of Information Capital. This book details a study that was undertaken from 1999-2009 in two neighborhoods in the greater Philadelphia area. One neighborhood is very affluent, one is very poor. This book is heartbreaking, and I have begun to see an entirely new value in the use of technology with young children in libraries. I have heard of the app gap, obviously, but it had never felt as visceral as Neuman and Celano have portrayed it. Neuman has been studying this for years, and has been an outspoken challenger of the “screen time is bad” notion; she wrote Literacy in the Television Age: The Myth of the TV Effect in 1991 and updated it in the second edition in 1995. She and Celano were also the ones who evaluated ECRR in 2010. The word “engagement” keeps coming up over and over in my reading; the Campaign for Grade-Level Reading talks about Parent Engagement, conversations with friends (“I talked about apps with my wife; she now uses them with our son. We know now that it’s ok as long as we do it WITH him”), Neuman and Celano’s Book, and the 800 pound gorilla, Every Child Ready to Read 2. The work that I’m concentrating on right now uses ECRR2 as a framework for incorporating digital media into storytime. When I first began doing this, it was mainly intuition and habit; probably because the library system that I was trained in to do storytime made ECRR (the first edition) available to me, and we used the 6 early literacy skills in every one of our programs. (Stanislaus County, I maintain to this day, employs some of the finest storytellers and children’s librarians I have ever known, even in the middle of California’s perpetually economically depressed central valley). I feel comfortable using an ECRR2-inspired format to run my programs, so that’s where I started. The more I read, however, the more I understand what a great framework it is. That said; ECRR2 is just a set of tools, and you need to use tools the right way for them to be effective. I have heard varying opinions of ECRR2; it can be implemented very well, it can be implemented very badly, “why are we modeling out programs to get kids ready for an educational system that is completely failing? !”, “who the hell are THEY to tell me how to lead my storytime?” etc. But the more I learn about ECRR2, the more I think it’s the ideal tool for children’s librarians to use to A) get THEMSELVES used to the idea of omnipresent technology in children’s services and B) to guide parents through establishing good media habits and being able to recognize good content. ECRR2 is designed to help parents/caregivers to become their child’s first teachers and support their young child’s early literacy development. It comes as a surprise to many of us graduate-degree laden folks that not every parent has the resources, experience, modeling, or support to do that instinctively. Adding the motivational power of technology to this framework plus giving parents high quality options for media consumption may not just have an impact on individual children’s literacy; it could have a positive impact on our society as a whole. Now I see that one of the giants of children’s literacy research (Neuman) is in FAVOR of using technology with young children, I am even more convinced that ECRR2.0 (as I loving refer to ECRR + technology) will be the tool that brings our profession to the forefront for the evaluation, curation and implementation of interactive children’s media in early literacy programming. nanos gigantum humeris insidentes: We are standing on the shoulders of giants. Early Reading skills, particularly the first part of the reading equation- phonological awareness (rhyming, alliteration, segmenting and blending) and letter name knowledge- are especially well-suited to the mastery learning capabilities of the computer. With adult supervision, computer programs, specially orchestrated to drill and practice these skills, can make the work like play, in a manner that builds both speed and fluency. Consequently, what would ordinarily be a centerpiece in kindergarten is now in the hands of a miraculous machine and an authoritative parent who is guiding his or her child at age 3. When you take the drudgery part out of the reading process- learning the basic decoding skills- and make them automatic, you provide working memory capacity to do other things, such as thinking about what you read in the text. This is the fun part of the reading process because it allows you to learn and develop knowledge that will be critical for the second part of the reading equation- comprehension. In some respect, then, the sooner a child can learn the nuts and bolts of reading, the sooner he or she can begin to build a knowledge base and become an independent learner- and the sooner, too, that the child can build the conceptual base that will be critical for the development of information capital. Before this time of independence, however, children will need adult assistance in learning about reading and learning to read. In this environment in which the playing field is somewhat level [the library], our observations made plain the centrality of adult scaffolding- even with these so-called self-teaching programs. There was a power dynamic that differed across settings [affluent neighborhood library & impoverished neighborhood library]. In one setting, the power seemed to be held by the parent, who manipulated the tools to their children’s learning advantage. In the other setting, the power balance seemed to favor the tool, with the parent deferring to its will, and allowing the child to take ownership. This relationship seemed to hold true regardless of whether the tool was a book or a computer. Posted on April 8, 2013, in Early Literacy, Literacy, Media Literacy and tagged ECRR, Joint, Susan B Neuman. Bookmark the permalink. 3 Comments. OMG – I just had an epiphany of my own. Why not relate apps to the ECRR skills– I do it with picture books, now I will do it when evaluating and recommending apps. I was nearly there, but this seals the deal. You are a thought provoker!